Looking for a sweet activity that the whole family can enjoy? Prepare brownie mix at home! Alice Currah from SavorySweetLife.com Read the full post at Kitchen Explorers. In a gallon-sized ziplock bag, add the flour, chocolate chips, white and brown sugars, cocoa powdered, baking soda, and salt. Seal the bag. 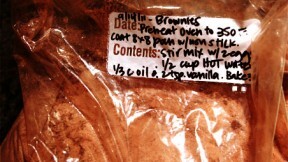 Write directly on the bag: DIY Brownie Mix. Instructions to actually make brownies: Preheat the oven to 350 degrees F. Grease a 9×13 pan for thin brownies or a 9×9 pan for thick brownies. In a large bowl whisk 1/2 cup hot water, 1/3 cup oil, 2 eggs, and 2 teaspoons vanilla extract together until well combined. Add the brownie mix to the wet ingredients. Mix the ingredients until the batter is smooth but thick and all the dry ingredients have been mixed in. Pour the batter into the prepared pan. Bake for 35-40 minutes until done. Allow the brownies to cool before cutting into squares.